Celtics can’t overcome poor fourth quarter | Keizertimes | You think you know. To be sure, read Keizertimes. 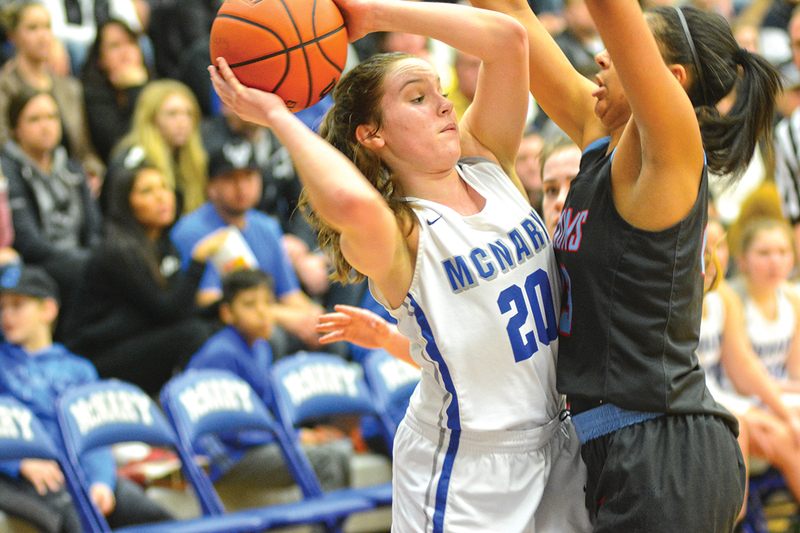 For three quarters, the McNary girls basketball team practically played even with South Salem — who won the Mountain Valley Conference regular season title. However, a poor performance in the final eight minutes doomed the Celtics down the stretch on senior night. The Celtics scored just three points in the fourth period and only shot 10 percent from the field as South Salem was able to come away with the 53-40 victory over McNary on Friday, Feb. 22. Leah Doutt was the only Celtic in double-figures with 18 points, and the sophomore point guard showed her aggressiveness from the get-go, scoring nine points in the opening period. “I definitely came up pumped up for the game and I knew that I needed to lead my team in order for us to win,” Doutt said. South threw a variety of different defensive looks at McNary in the first half, including a 1-2-2 and 2-3 zone. The Celtics, however, didn’t appear phased in the slightest. Sabella Alfaro found a hole in the zone late in the period and knocked down a short jump-hook after Doutt zipped a pass to her in the paint. Moments later, Abigail Hawley hit a mid-range jumper to cut the South lead to 18-15 at the end of the first quarter. The Saxons got hot from the field in the second quarter and took a 28-19 lead midway through the period. McNary, however, responded with transition hoops from Doutt and Alfaro. Hawley and Annie Leigh Besa each nailed a pair of free throws late in the half to trim the deficit to 32-27 at the break. McNary was able to tie the game at 34-all in the third period after a pair of hoops from Doutt and Hawley, as well as a 3-pointer by Alfaro. The Celtics even took their first lead of the game at 37-36 with less than two minutes remaining in the quarter. But South Salem scored twice before the end of the quarter to take a 40-37 advantage into the final period. McNary got the lead back down to one with 5:07 left in the fourth quarter when Doutt nailed a triple just left of the key. It ended up being the final time McNary scored in the game. With seven turnovers and nine missed shots in the period, the Celtics squandered any opportunity they had to get back in the game as South Salem finished the contest on a 12-0 run.